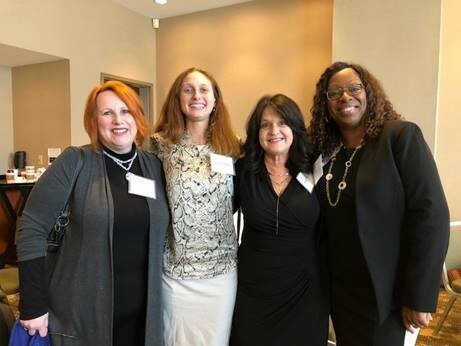 From Left to Right: Anna Foote, Southeast Regional Director, On the Rise Financial Center; Michelle Parker, Federation Program Officer; Sandy Headley, Vice President, Access to Capital for Entrepreneurs; and Deirdra Cox, President, Community Sustainability Enterprise. 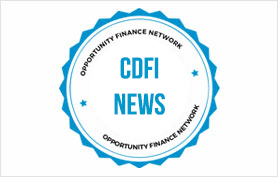 Last month, I traveled to Atlanta for two days of events exploring the social determinants of health, which included discussions on the topics of financial inclusion and how CDFIs use impact investing to help communities thrive. Anna Foote, Southeast Regional Director of the Federation's On the Rise Financial Center, and I attended the Opportunity Finance Network/Healthcare Georgia Foundation Building the Capacity of CDFIs in Georgia convening in Atlanta, where we shared our CDFI capacity-building efforts throughout the state of Georgia. We presented the Pathways to Financial Empowerment program work that we're doing with Peach State FCU to expand rural counseling services. The Federation's and Neighborhood Trust Financial Partners' Pathways program is an innovative, technology-supported financial counseling model that supports financial inclusion and empowerment among underserved communities. With support from the Building the Capacity of CDFIs in Georgia initiative, Peach State FCU is expanding access in rural communities to Pathways' best-practice financial coaching and counseling program. At the convening, Anna and I also had the opportunity to share more information with the group about our financial empowerment initiatives in Atlanta, where our On the Rise Financial Center, in collaboration with credit union partners 1st Choice CU, BOND Community CU, Credit Union of Atlanta, and Peach State FCU, promotes financial inclusion by providing Westside residents with financial education classes, one-to-one coaching and access to affordable accounts and loans. The Center also is a flagship location of the Pathways program. Many national and local CDFIs joined us for the convening, including Albany Community Together, Carver Financial Corporation/Carver State Bank, Community Health Center Capital Fund, Georgia Cities Foundation, Neighborhood Lending Partners, LiftFund and Southwest Georgia United Empowerment Fund. We also connected with regional funders who are interested in aligning their endowments with their mission (social determinants of health). Foundations are required to give 5 percent away annually, but many more are looking to increase the breadth/depth of the grants/loans that they make. While in Atlanta, I also got to attend a few sessions as part of the Healthcare Georgia Foundation's Connections 2018: Pathways to Healthy and Equitable Communities conference. We heard from healthcare leaders including Dr. Paula Braveman, Director of the Center on Social Disparities in Health of the University California, San Francisco, who discussed the myriad social and economic factors that shape overall well-being. It was validating to hear the growing body of research that supports the clear link between health and economic conditions, and inspiring to consider the many opportunities and various routes available for advancing community health and health equity, as we continue our work addressing financial well-being, community development and other socio-economic determinants of health. This post originally published by the Federation. Michelle Parker, Federation Program Officer, attended the OFN and Helathcare Georgia Foundation Convening and the Connections 2018: Pathways to Healthy and Equitable Communities Conference in Atlanta, GA in March.